I've mentioned once or twice that I'm about to lose the second toenail on my left foot. The same one on my right foot is in questionable territory. For about a week after the walk, every time I pressed down on my left toenail, a stream of blister liquid would squirt high into the air like the fountains at the Bellagio. The erupting has finally subsided, but my toe still throbs at the end of the day, a steady drumbeat bringing me immediately back to the 39.3 miles in Washington, DC the first weekend of the month. 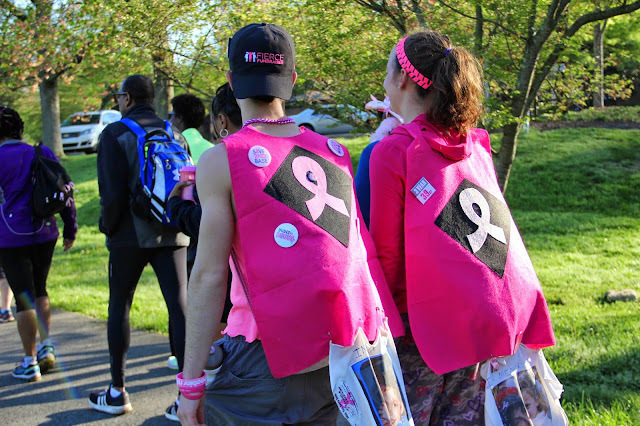 Plus another 4.8 miles criss-crossing Capitol Hill the Tuesday afterward to advocate to whomever would listen for an end to breast cancer. My feet were not entirely pleased, but they will recover. A few of us in front of President Obama's house. As my friend and veritable co-captain Ginelle says, it's not like I'm losing another body part. The blisters are painful. But as many shirts and temporary tattoos over the weekend read: "Blisters are temporary. Fierce is forever." And toenails grow back. Breasts, sadly, do not. Ginelle brings me to near tears every time she describes the metaphors surrounding the walk: the pain and frustration when you don't think you can keep going, but then you remember it's temporary. It's only two days. The walk certainly isn't chemo, but it gives a peak into the determination necessary to push through when the going gets rough. Looking around, there are women and men in far worse shape, forging ahead despite their obvious limping. There are kids who've recently lost their mom and who stop at every mile marker to wipe away their tears and take a proud selfie. So you see all these people marching onward, and it pushes you to keep going, too. I asked my teammates, many of whom were first-timers, for their thoughts on the walk. I am beyond flattered by what they had to say about me, and largely because of them I'm inspired to do this all over again next year. Here, in their own words, are some of their descriptions of our weekend in Washington. Amy: Being part of it was simultaneously so difficult and so meaningful, and feels at the same time like a big accomplishment and yet also such a tiny drop in a giant bucket for what is needed. My main feeling seems to be thanks - thank you for letting me walk with your team and your friends, and thank you for letting me lend the support I can. The idea that maybe a few dollars that I helped raise will give women with no health insurance access to mammograms, or feed a few families when they are wanting to do anything but cook for themselves, is such an important one for me. And the hope that this foundation supporting mets research so that women like you can continue to be such amazing role models, mothers, and writers is just more than I can think or even talk about very eloquently. Ginger: I now have an appreciation for the number 39. One of the most painful but rewarding experiences of my life. Despite my mental resolve to keep going, I kept feeling like my body was failing me--a perfect illustration for what survivors endure. Thank you to everyone who has supported us--you were all with me yesterday and today. My 39 miles were dedicated to my mom, Betsy Elliott, who is a survivor of DCIS breast cancer (that is, ductal carcinoma in situ and caught early, thank goodness). She is recovering fully after a unilateral mastectomy in March of this year. Now that my feet have begun to recover, I'm already considering next year's Avon Walk. The 16 of us crossing the finish line on day 1. Jess V.: It's amazing how many tears and thoughts that come over you as you walk this long walk. I feel so honored to have been a part of this team. Thank you, Jen, for leading us through a wonderfully rewarding weekend, yet again. As I told [my husband] and the others who asked me how the walk went - this one was harder. I didn't train. I bought the wrong shoes (without much support). I said with confidence "I never get blisters" and got several epically huge blisters. By mile 10 on the first day I started to have significant tightness in my legs and difficulty walking with a normal stride. But it's really easy to get over that pain when you walk by a woman clearly in the process of fighting cancer. Suddenly your legs don't hurt as much and you realize how easy your pain is versus theirs. I can't wait to do it again next year. I'll be signing up tomorrow just because I'm too wiped out to do it right now. It was such a wonderful experience walking with you all. Looking forward to Avon Chicago! Beth V.: You people are all so amazing, not only for participating in this amazing walk, but also with the fundraising. For a team of 16 to raise as much money as we did is incredible (obviously a testament to the smarts and savvy of our team, and especially our team leader, Jen!) As for the walk itself, I appreciated the collaborative nature of our team and how we stuck together. I didn't expect that a group our size would--especially in light of the many potty breaks--and was pleasantly surprised. Our solidarity as a team and commitment to an important cause so close to all of our hearts made this weekend particularly special for me. Thank you all for a fun, positive, successful and memorable experience. The kids who brought me to sobs on the trail, with a photo of their mom holding them as toddlers hanging from their capes. 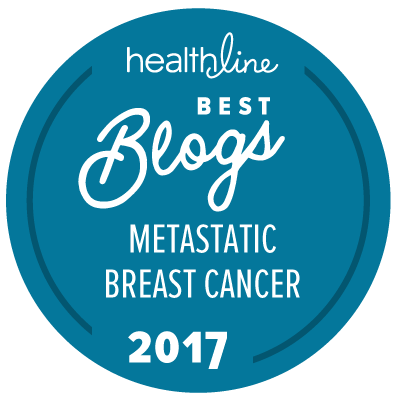 She died of metastatic breast cancer last year. Kacey: My impressions from this weekend all come down to community. I was so moved by how many people came together to make this walk happen for us. I was completely blown away by the donations I received. The number on my personal page is a little off because I shared a lot of the donations I received with team members who were under the minimum a few months ago, but I think I raised a total of close to $8,000. Most of my donations were small amounts - it was a very grassroots effort! And many donors gave more than once. When Nora and I organized our wine night fundraiser, we ended up with more silent auction prizes than we knew what to do with because businesses and friends were so generous. We were so worried that the night would be a bust and we'd end up giving away these amazing prizes. But we were shocked by how many people came out and the volume and amount of bids we received. It was truly inspiring. The weekend of the walk, we had so many supporters. Dan and Sarah hosting us for a pre-dinner walk, Tim traveling down from MD to walk a few miles with us, my own husband trekking all over DC to find us so my kids could hold up a sign for a few minutes (and the baby could eat! ), plus all the husbands behind-the-scenes who watched little ones for the entire weekend so their Moms could do this. That doesn't even include all of the strangers who stood on street corners, dressed in crazy outfits, cheered, handed out candy, high-fived, and generally kept morale up. By mile 10 on Day 1 (just 1/4 of the way done), I really didn't think I would be able to keep going. Everything from my waist down hurt. But I thought about everyone who supported my efforts to be there and everyone who was relying on me and I just kept going. It was only two days of my life and nothing some ice and an epsom salt bath couldn't cure. 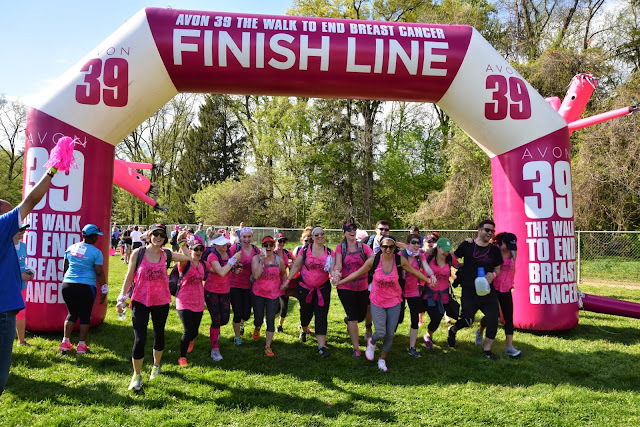 If being out there and being a part of the community that made this walk possible has in any way helped put an end breast cancer, then I'd walk it a thousand times over (perhaps after training a bit more, though?). Thanks so much for letting me be a part of this incredible team, I really do consider it my privilege to have been there. 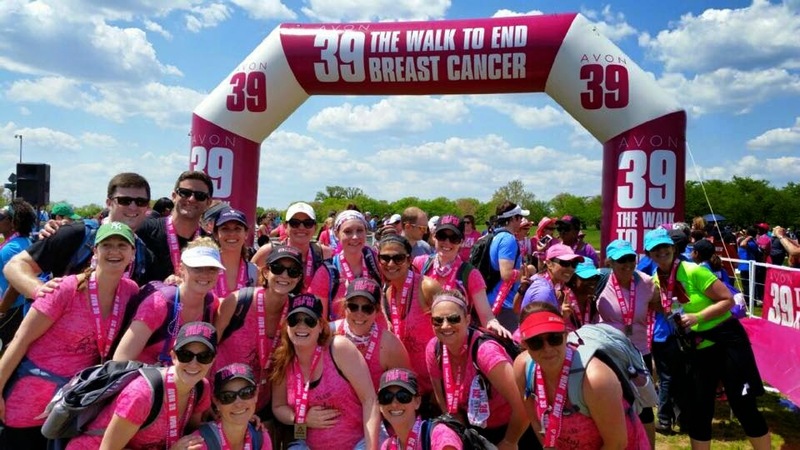 Jessica D.: I was inspired to sign up for the Avon 39 in D.C. right after Jen and Team Booby and the Beast completed their 3rd walk in 2014 in San Francisco. 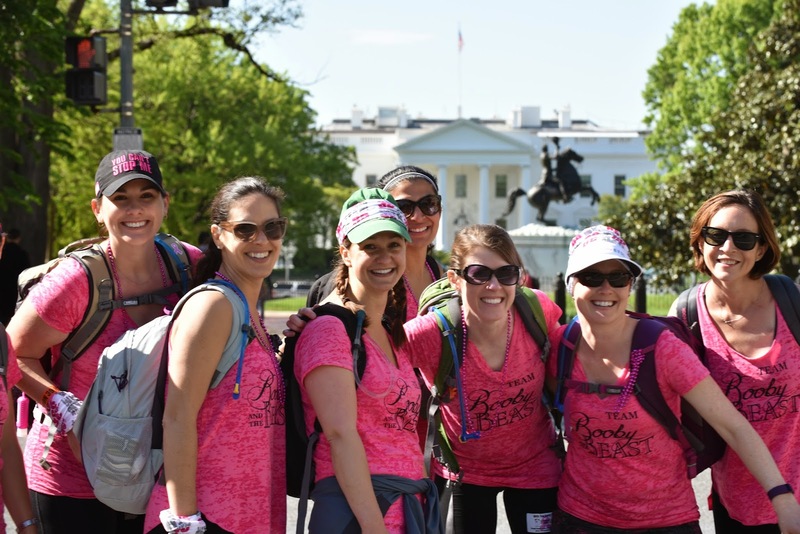 I continue to be amazed by Jen’s strength, as well as the advancement of breast cancer treatment, and wanted to do all I could to raise money to continue research efforts in the field. As I tend to do with any trip, event, or race (guess it’s the engineer, or now the ‘mom’ in me), I plan, make lists, check them twice, and worry about the little details. I set out on a training plan walking miles and miles around Tempe before dawn, rallied lots of support among my family, friends, and co-workers, and made sure I had all the right gear for the big weekend. However, nothing can quite prepare you enough for how incredibly moving this event is. The support of honking car horns; the spectators providing countless high-fives, candy, baby wipes, and some tunes to put a beat in our steps; and most importantly, the bond among our team members that was solidified throughout the journey were more motivating than words can even describe. I am truly thankful for being a part of this memorable experience, and can’t wait to do it all over again! Thank you, Jen, for letting me be a part of it all! Shelby: Every year I'm amazed by the impact this walk has on me. To say that walking alongside Jen and an incredible group of amazing women and men, for the third year in a row, is a remarkable experience feels like such an understatement. The weekend is absolutely amazing, emotional, inspiring, challenging, empowering, and rewarding as we raise money for breast cancer research and to fund access to care for those without the means. As soon as we cross the finish line, hand-in-hand with our awe-inspiring Team Captain, I look so forward to next year's walk. Thank you Jen for continuing to share your story, for inspiring so many, and for allowing us to share this incredible experience with you. I feel honored to have been a part and to have walked alongside each and every one of 2015's Team Booby and the Beast. Here's to Chicago 2016! Gretchen: There isn't much to say that hasn't been said. I just wanted to say THANK YOU, Jen for inspiring us and for the opportunity to walk with you. Team Booby and The Beast is a powerhouse! This amazing group of men and women surrounding you is a testament to the absolutely fabulous person you are. Team, I was honored to walk with each and every one of you. At the finish line on the National Mall. It feels wonderful to have this kind of support and understanding. Congrats to you and your team. And thank you for doing this, for all of us. You've done so much! I hope you get some rest too. Love it. Hope your toes heal soon! They're already (nearly) good as new!